Last Tuesday, I mean the Tuesday before last (though I can’t really believe it’s been THAT long) I had a plan. I had a party scheduled for that evening at my house. I had to go to the dentist, do a few hours of work, vote YES! for the school district levy, and then do the last minute cleaning and party prep. Totally do-able plan, right? Except kids. Kids make do-able plans totally un-do-able. My older dude is out of school for a 3 week spring break. This was day 2 of that break. A neighborhood kid from from his school was hanging out at the house. My little dude came home from school and they all three went outside to play. It was 4:30 and I was just getting my shoes and looking for a bra to put on so we could all go vote really quick. The party was scheduled at 6:30 and I still needed to shower so, you know, time was getting a little short. I flew down the hall to the kitchen and my older dude’s friend was saying, “He’s hurt! He fell! He needs you!” and before we could run out the door he came in holding his chin, crying, screaming, with blood running down his arms. I knew that posture. I knew that look. I knew that feeling. Flashback to 1980, the first day in our new house with a swimming pool. 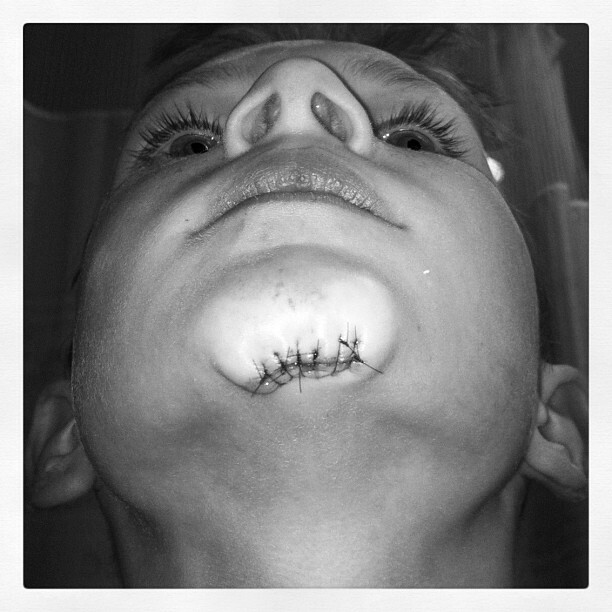 I said, “Just one more, mom,” as I stepped on the diving board, my foot slipped, and my chin hit the diving board. Hard. I got my first stitches ever that day. Flashback, again, to about 1989, and I’m rock-hopping at Dinkey Creek with my cousin and my foot slips on a wet rock and my chin connected with the rock. I walked back to our cabin and I just KNEW I had split my chin open again. I knew it. And as I looked at my son and he tilted his head up for me to see the wound I just knew it. I mouthed to my husband “stitches” and he quickly gathered up the big dude in his arms and walked him to the car, amid hysterical screams and cries saying, “no, no, just give me a band-aid!” and he sat holding my almost 10 year old in the backseat all the way to the ER. Daddy-made seat belt, as it were (not safe, I know, but sometimes you do what you gotta do). I grabbed the little dude, my purse and a bra and hopped in the car to drive to our “usual” ER/Urgent care. (It’s not a full hospital but does have 24 hour ER care and, yes, we’ve been their multiple times). I frantically called my stepmom – could she come over early and help do the final prep stuff for the party? The party that is in 2 hours? No, she had the days wrong and couldn’t come over tonight. I called my mom-in-law and she wasn’t feeling well enough to come either (and she’s having surgery next week so she gets a pass for these things!). By this time it’s 4:45ish. What to do, what to do? Well . . . cancel the dang party. In the end – 1 very painful shot, 6 stitches, 3 hours in the ER and a tub of ice cream and a Red Box movie. He was such a trooper. The shot was the worst part – for him and for ME – but once that part was done he just settled down and let the doctor stitch away. He later told his friend it was a “piece of cake.” That kid. Thank goodness kids are resilient. So the party was cancelled. C’est la vie! There will always be parties. But when my boy is my age he’ll remember me holding his hand the entire time he was getting stitched – just like I remember my dad doing for me. Um, the second time. And the party? I didn’t reschedule. The food wouldn’t have kept. So I took it all to my office the next day and my co-workers had a Tastefully Simple feast.